Lester B. Pearson – Pearson College UWC was created to honour the legacy of Nobel Peace Prize Laureate Lester B. Pearson, a former prime minister of Canada, whose vision of peace and global cooperation inspired the founders of the school. Lester B. Pearson was recognized in 1957 for his vision in conceiving and creating the first UN multinational peacekeeping forces. Unique geographic and spiritual environment – Located on the mild west coast of Canada on the traditional territory of the Scia’new (Beecher Bay) First Nation, the campus’ forested and temperate coastal location encourages students to undertake challenging academic and experiential learning in both modern classrooms and outdoors year-round. Ecological Reserve – Pearson College UWC acts as the eco guardian for the world-renowned Race Rocks Ecological Reserve. Students learn through marine sciences courses, diving activity and volunteering on the reserve. Pearson College UWC offers the International Baccalaureate Diploma Program (IBDP) curriculum. Alongside standard courses, the College offers Philosophy, Marine Science, French, Spanish, Visual Arts and Theatre. At Pearson College UWC, students learn by doing, particularly through the Creativity, Activity, Service (CAS) program. To graduate, students are expected to complete 80 hours of service between first and second years, often in their home communities. Once per term, students plan, design and carry out individualized or small group projects. Students share international music, dance and stories of their homelands and their international experiences at the annual One World community event. They also run and participate in regular community events such as Global Affairs, Special Topic Days, Regional Days, Village Gatherings and can volunteer for the campus Emergency Response Team. Students are required to periodically work as kitchen team members and assist with recycling, library service and related campus jobs as part of their Village Service. Weekly student-led fitness programs supplement daily fitness opportunities. Each summer, the College brings together youth from around the world for the Pearson Seminar on Youth Leadership (PSYL): a three-week UWC experience that gives them the opportunity to build an international community committed to creating positive change in the world by taking risks in our learning and leadership. Students, as well as many faculty members and their families, live together on campus. Facilities include five student residence buildings accommodating 40 students, four in each room, plus a House Parent apartment. The facilities are built in a West Coast modern style designed to reflect and respect the natural setting and include a waterfront dining hall, state of the art science labs, classrooms, a 300-seat theatre, small lecture hall, visual arts facilities, an Education Resource Centre/Library and a Spiritual Centre. Unique architectural features include a floating marine sciences centre on the bay that contains a well-equipped seafront environmental systems lab and a hilltop observatory that facilitates astronomy study and exploration of the night skies. Students also conduct research above and below water at nearby Race Rocks Ecological Reserve. On-campus recreational facilities include a 25m indoor pool and exercise room, outdoor tennis, basketball and volleyball courts, soccer field, student common room and extensive hiking and cycling trails emanating from the campus. 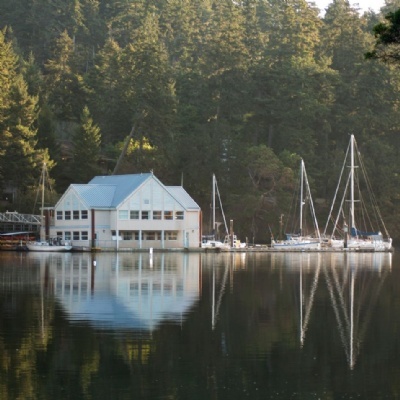 The campus is in a beautiful forested setting on Pedder Bay near the southern tip of Vancouver Island on the west coast of Canada, about 30 kilometres southwest of the provincial capital of Victoria, British Columbia. Students apply through their UWC national committee or through the UWC Global Selection Programme. Exceptions to that are only within refugee or stateless populations and unique cases. For more information about Pearson College UWC, visit the website.